A vessel carrying more than 900 migrants has docked on the Italian island of Sicily. 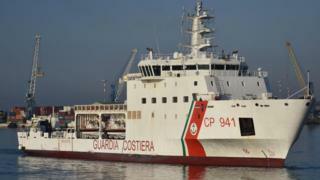 The Italian coastguard vessel, the Diciotti, had picked up the migrants off the coast of Libya. Italy on Sunday had refused to allow the Franco-German ship Aquarius, packed with migrants, to dock, sparking an international row. The Diciotti was allowed to land as it is an Italian vessel carrying out a government mission. It sailed into Catania on Wednesday morning, carrying 937 migrants and the bodies of two people who had died making the voyage. What happened with the Aquarius? The Aquarius, which is carrying 629 migrants, is run by the Franco-German NGO SOS Méditerranée and had to be granted permission to dock. Matteo Salvini, Italy’s new interior minister and leader of the right-wing League party, refused permission as part of a new hard line policy on migrants. He said Malta should accept the Aquarius but it refused, arguing it fell under Italy’s jurisdiction. Eventually, Spain’s new PM Pedro Sánchez said he would give “safe harbour” to the Aquarius. Escorted by two Italian ships, it will dock in Valencia on Spain’s western coast on Saturday, the rescue charity running the ship said. What has the fallout been so far? French President Emmanuel Macron accused the Italian government of “cynicism and irresponsibility” for refusing to let the Aquarius dock. The French ambassador to Italy has been summoned to the Italian foreign ministry to explain the statements of the French government. What is the situation of migrants in Italy? Most migrants who survive the perilous voyages from North Africa end up in overcrowded Italian camps. Reality Check: Is Italy taking in thousands of migrants? Among them are refugees fleeing war and persecution, who have a right to asylum. In the past five years, Italy has taken in more than 640,000 mainly African migrants. Italy says its EU partners must help ease the burden.